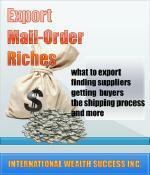 Export Mail Order Riches | Yenom Marketing Inc. This book covers deciding on products to export, finding suppliers, locating overseas firms seeking exports, form letters, listing of firms serving as export management companies, shipping orders, and more. 50 pages; $17.50.